You’ve probably seen this two-panel cartoon before, or a version of it. It may have even appeared in a training or presentation you’ve attended recently. The team at Center for Story-based Strategy, including the illustrator of this version, want you to know that while distinguishing the concepts of equality and equity is useful, it takes a lot more to start a fruitful conversation. In fact, when we stay in these two boxes only, we often invite dangerous and counterproductive conversations. We offer #the4thBox and its two facilitated learning options to assist in expanding how we explore and address issues of equity. Participants with privilege or resources raise concerns about “their boxes” being taken away. The either/or logic of 2 boxes erases the idea that we each might experience different boxes at different times/places in our lives. A focus on debating equality vs. equity avoids deeper conversations about how did we get here and what else is possible? Versions of the image with a third box, for Liberation, get us a bit further — introducing the idea that narrative assumptions often hide in plain sight. “The conflict in the story isn’t the same if the obstacle is removed!” And still, this view is too simple and linear. Does the third box really come after the second? Wasn’t the third box really first, before the fence was built? 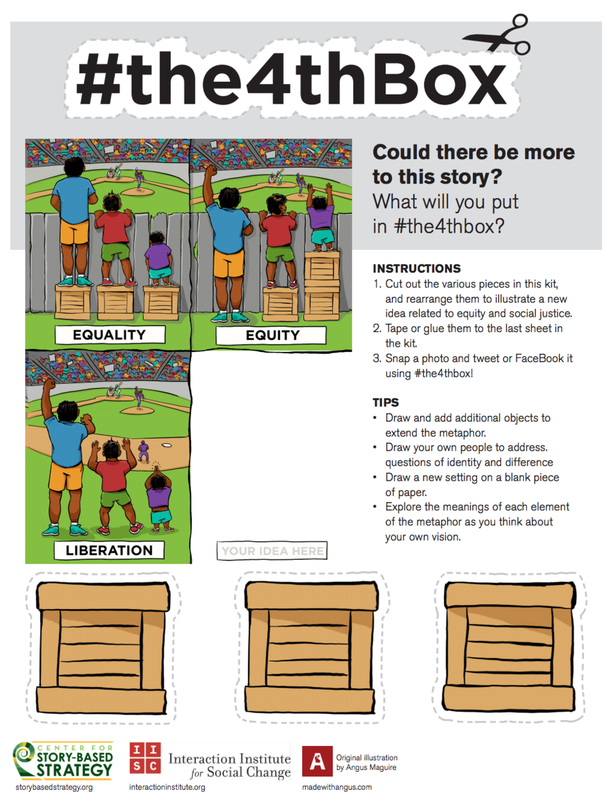 If we want outcomes of equality, equity and liberation in our lives and work, then we need to empower learners to explore, vision and pursue these goals themselves, and THAT’s where #the4thbox comes in. Use the links below to download #the4thBox today! We can't wait to see & hear what you imagine! Send us an email at the4thbox@storybasedstrategy.org and tell us how you integrated #the4thBox in your work!